Knowledgable mushroom lovers all over the world wait until the fall of the year to pursue the robust oyster mushrooms that grow on trees in the wild. Shortly after the first rains of the season, the snow-gray petal-like beginnings of P. ostreatus can be found. 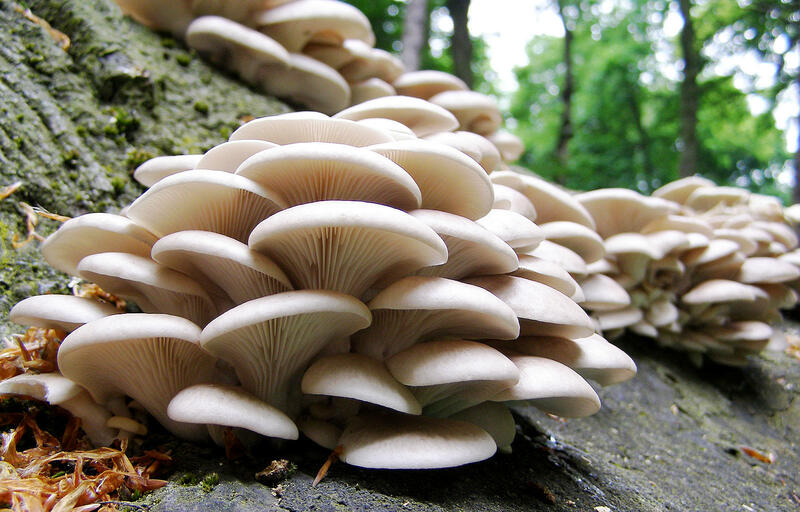 The autumn forest is brightened with the delicate, young, translucent, eccentrically stemmed caps cascading shelflike from the surface of dead hardwood trees. The cap is scallop shaped and has a delicate aniselike aroma not usually found in oyster mushrooms grown on artifical material. Occasionally, tan caps will be found, and some of these can spread out to 18 inches in diameter, with thick, meaty flesh. It is possible to gather caps from a single log two or three times in one season. 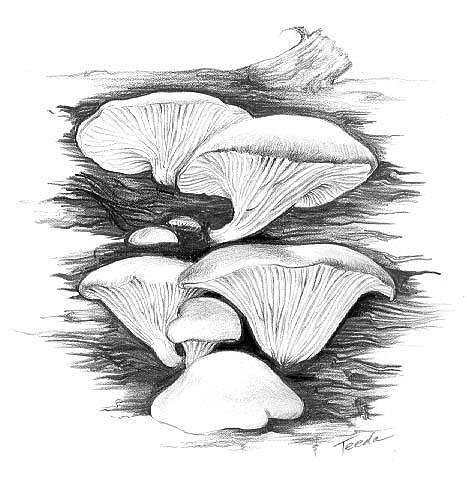 The most recently introduced cultivated Pleurotus is outstanding: it has delicate daffodil-yellow flowerlike caps with pure white stems, and grows in large clumps. One such group could be used as a centerpiece for a dinner table. The almost fruity aroma reminds one of certain zinfandel red wines, and this sweet quality is not lost in cooking. Prepared in a baked noodle dish, its pleasant flavor mixes with the other ingredients without losing intensity. Try to buy those which have large caps. The small specimens do not have the same fine flavor. Cook the same way as P. ostreatus. The stems of the yellow Pleurotus may be quite bitter to some individuals, in which case they should be removed and discarded. Cut off the lower part of the stems of all oyster varieties, especially when using cultivated caps, to remove any shreds of straw or wood. The base are tough, so discard it. 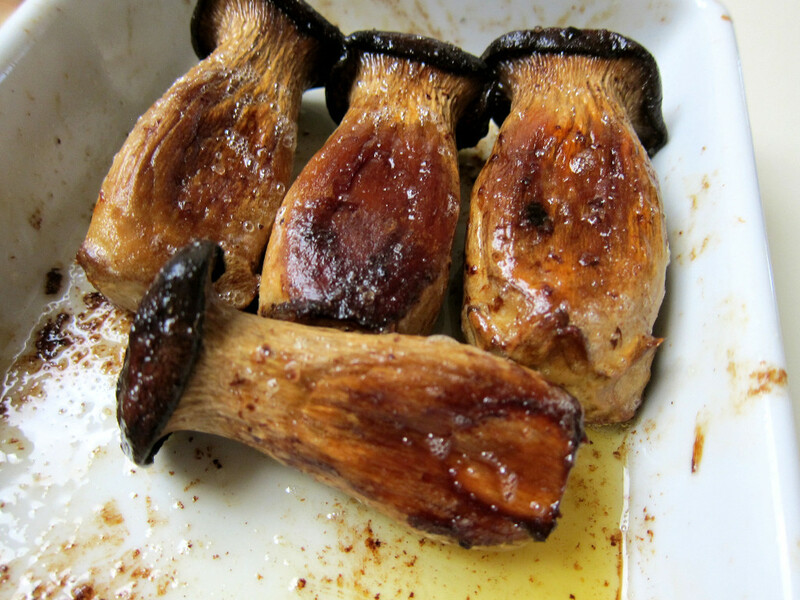 Be certain to rapidly flush out the gill spaces of wild mushrooms. Insects enjoy this sanctuary. Use a minimum amount of water, since P. ostreatus is naturally quite moist. Gently press between paper or cloth towels to remove excess liquid. All species of Pleurotus are cleaned in the same manner. A robust soup for a cold night. Melt 2 tablespoons of the butter in a large saucepan. Add the mushrooms and onions, and cook for 3 minutes or until tender. Remove with a slotted spoon and keep warm. Add the remaining 2 tablespoons butter to the pan and slowly cook the potato cubes for 10 minutes or until tender. Gradually stir in the milk. Add the salt, pepper, mace, Tabasco, and thyme. Allow this to come to a boil, then remove the pan from the heat. In a mixing bowl, combine the egg yolks, sherry, and half and half and slowly blend the mixture into the chowder. Add the onions and mushrooms and heat almost, but not quite, to a boil. Taste to correct the flavoring. Serve at once in soup plates. Float the bread cubes in the soup and sprinkle with parsley. Pastry flour makes a lighter batter, but all-purpose flour can be used as a substitute in this recipe. Beat the egg slightly in a mixing bowl. Stir in the cold water, flour, cornstarch, baking powder, and salt to make a thin batter. Dip the mushrooms into the batter. 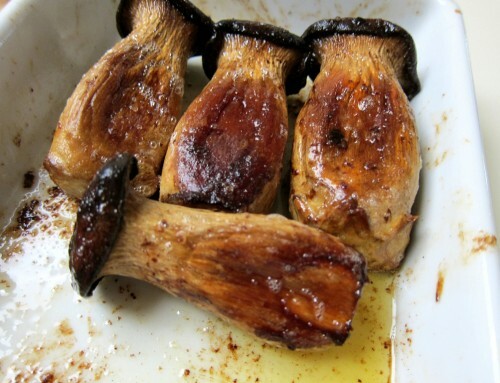 Heat the oil to 375º and deep-fry the mushrooms until golden brown. Drain on paper towels and serve immediately. 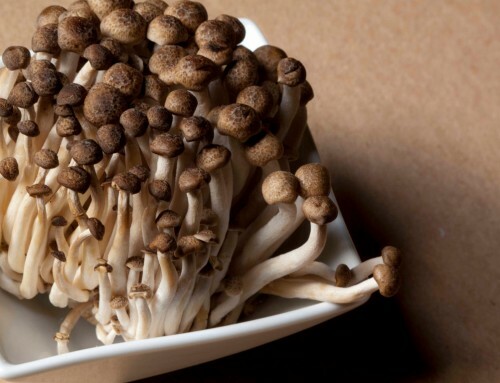 Sautéed oyster mushrooms are similar to abalone in taste. Serve them hot. Put the flour, salt, pepper, marjoram, thyme, garlic, and paprika in a small paper bag. Add the mushrooms and shake well. Heat the butter and oil in a sauté pan or skillet and sauté the mushrooms on each side for 2 minutes or until golden brown. Serve immediately with lemon wedges and/or soy sauce. 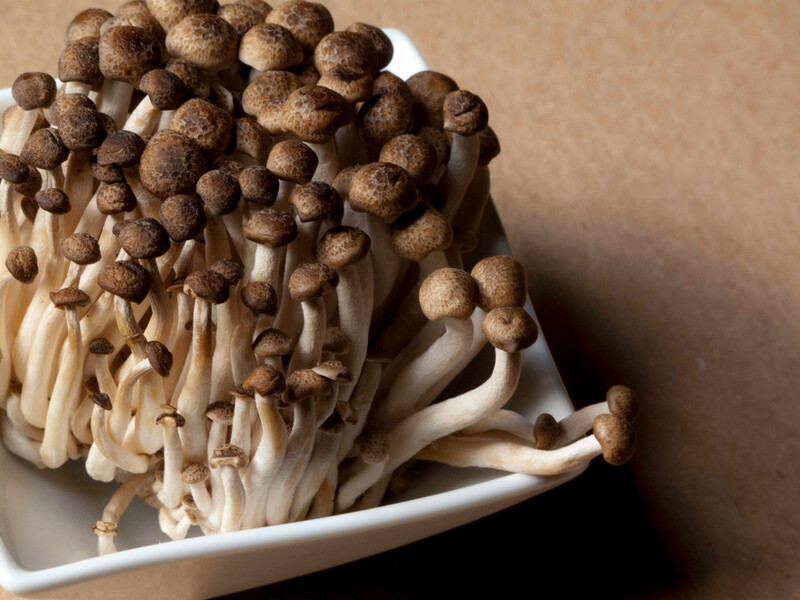 Most mushrooms may be used with scrambled eggs, but oyster mushrooms converts them into an elegant main dish. Dredge the mushrooms in the flour. Heat the oil in a large sauté pan or skillet. Add the mushrooms and cook until brown. Add the shallots and continue to cook for a few more minutes. Stir in the eggs, Tabasco sauce, parsley, salt, and pepper. Scramble the eggs and sprinkle the sesame oil quickly over the eggs while they are still soft. Serve immediately. Oyster mushrooms are incorporated in many Asian dishes. They cook quickly, and are therefore naturals for stir-fries. Using a wok or skillet, heat the peanut and sesame oils together until bubbling. 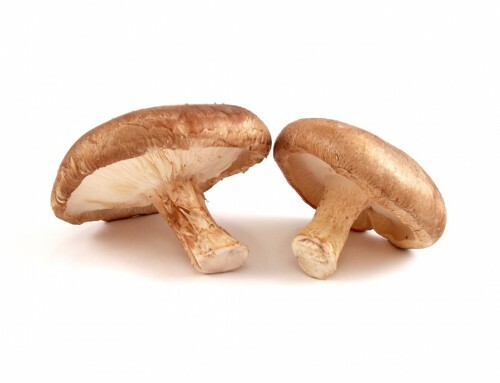 Add the ginger, garlic, mushrooms, peas, and sugar and quickly stir-fry for 2 to 3 minutes. Add the broth. Cover and simmer for 3 to 5 minutes. Add the tofu and soy sauce. Cook uncovered for 3 minutes. Serve immediately over rice.